He launched a new, digital publication. He began making a profit on it. By the second issue. 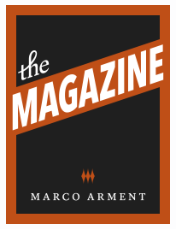 Marco Arment, a developer, small business owner, blogger and technology-focused podcaster, launched The Magazine a few weeks ago. It’s a stripped-down, gorgeous, text-only (for now) iOS Newsstand publication that gathers a biweekly collection of topics that Marco says is not limited to technology but which will “appeal to people who love technology.” After reading the first two issues, I’m thinking of it as something close to the experience of reading Harper’s in the 80s and 90s, when each issue begged to be read from cover-to-cover. Or, perhaps a very thin New Yorker, without the cartoons. Point being, this is a good solid read, albeit one you can make your way through in a couple of quick subway rides or bedtime reading sessions. The Magazine is a lean, bi-weekly (though that could change) collection of mid-length articles that so far have tended toward the kind of personal essay that shines a pin-spot on a small slice of life that ultimately reveals something of the bigger picture. In the current issue, for example, there’s Gina Trapani’s visit to the sperm bank as she and her wife do the pre-work that goes into two women having a child, Lex Friedman’s paean to the joys of wet-shaving and John Siracusa writing movingly about something you thought did not exist: a video game with a good heart. The price for this and a few other pieces, every other week: two dollars a month. Is this a bargain? Dollar-for-dollar, no, in the days when you can pick up a year of Wired or Vanity Fair for half that. But that’s not really the point. Because, if it weren’t for those two dollars, these stories would not exist. In the footsteps of similarly independent-minded Louis C.K., whom Marco invokes in his first issue, The Magazine is the result of a refreshingly single-minded purpose: to create something unique, not just as an artistic outlet, but as a business — a business, it turns out, that was given an extremely short runway. I’m starting this with a staff of one. I can develop the app, procure and edit the articles, and write occasional articles myself. There’s no venture capital funding, no corporate backer, and very little starting capital. My biggest fixed cost is the up-front design and development of the app, and my biggest recurring cost is paying writers. If it doesn’t turn a profit within two months — just four issues — I’ll shut it down. Partially from these constraints, and partially in the spirit of Louis C.K.’s anecdote, The Magazine’s articles won’t be laid out separately for portrait and landscape orientations. Articles won’t have custom designs at all. You won’t see any infographics, slideshows, or interactive panoramas. These multimedia features can all be valuable, and they have their places in other publications, but not here. So, it would appear, the experiment part is over. The Magazine, young as it is, is a profitable success. It has no photos. It has no massive multi-hundred megabyte downloads. Instead of taking minutes (or hours on slow hotel or departure-gate wi-fi), The Magazine downloads in seconds. Will people pay for content? Ask Marco. When I started working on this in August, it was definitely a risk. And until a few hours after it launched, I didn’t know whether it was going to be successful and well-received, or a huge waste of three months and a lot of money. In hindsight, it was obvious, but only because it succeeded. Had it been received poorly, its failure would have seemed obvious in hindsight, too.Of course that wouldn’t work. People will pay for content. They just have to want to. Keep an eye on The Magazine and other independent publishing efforts. You just might learn something. What a crock. There are hundreds of popular magazines and newsletters with a wide range of revenue models launched every month. Many are even subscription based. Some even make money on the FIRST issue let alone the second. This is because your big secret (I doubt Marco thinks it’s one) has been known since the days of Gutenberg, or even Homer. Sure, even more fail. But so do most business enterprises of any kind. Just because you don’t know about successful magazines doesn’t mean they don’t exist.